As Summer slowly but surely comes to a close, most of us are looking to take advantage of the beautiful weather while we still can. One of the many wonderful assets that Washington, DC has to offer is its parks, open air accommodations, and green spaces for the outdoor enthusiast. You don’t need to be on vacation to get your fill of quality landscape, which is why all three of our AdvantEdge locations provide unique outdoor spaces for those summer days when you simply can’t sit in your workspace any longer. Our L Street location boasts a rooftop patio-seating area with a stunning view of the surrounding downtown area stretching all the way to Rosslyn. With a capacity of 100 people, the rooftop can also be reserved in advance for special events whether it be a business meeting or a simple happy hour get together with your colleagues. Additionally, there is also an enclosed ground level patio should you prefer to get your fill of the outdoors in a shadier and more quiet atmosphere. 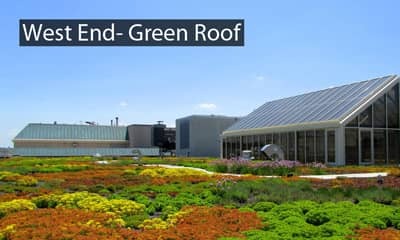 Nearby, our West End location- which is also home to the World Wildlife Fund- not only contains an 8-story sky-lit atrium to bring natural light into common spaces, but also possesses the third largest “green roof” in DC. In keeping with the building’s Platinum LEED certified status, the rooftop contains solar panels and over 53,000 types of plants that cover over 83% of the surface, a remarkable sight for a downtown office building! Our Chevy Chase location can be found within the Chevy Chase Pavilion, with our 6th floor atrium café providing ample natural light and a quiet alternative place to work or relax. An outdoor seating area is provided on the ground level of the Pavilion as well, perfect for taking an outdoor lunch without all the noise of the Wisconsin Avenue side of the building. We encourage all our clients to take advantage of our outdoor space options, especially when the weather is at its best! What better way to clear your mind and de-stress in the midst of a hectic day than to take a quick minute to appreciate the natural beauty of your DC surroundings, while still within the immediate vicinity of your office. To learn more about AdvantEdge’s locations and everything else we have to offer, feel free to contact us today!